"An unassuming shop in a quiet town. A pleasant young man. A less than noble lord. A personal hurt that must be salved." As noted a week ago, the Greyhawk fansite, Canonfire held a "postfest" on the theme of Greyhawk Lairs and Sidetreks. This week's sidetrek, Pyert is by Ragr, who also wrote the fiction piece, The Knot for Canonfire not long ago. Pyert is a cleverly written bit of drama for players to get involved with. The intrigue and agenda behind the humble character of Pyert brings to my mind the gritty, realistic-fantasy of the Game of Thrones series on HBO. Ragr makes good use of his Greyhawk material, including the 2nd edition sourcebook the Marklands, yet this easy to insert sidetrek could work for virtually any medieval domain a DM uses. Enjoy! A few weeks ago I was pointed out to the map for Wizards' upcoming boardgame, Conquest of Nerath. Set in the new "D&D Core World", this game contains some board spaces named after classic Greyhawk modules, such as the Tomb of Horrors, White Plume Mountain and Vault of the Drow. I didn't pay much heed to it at first, since these modules have been rehashed to the point where they are now generic enough to work in any world, not just the World of Greyhawk. So this game got no rise out of me, but weeks later, I stumbled upon this editorial by Bill Slavicsek in the recent eDragon #399 (wow one away from 400, sigh!) that talked about Conquest of Nerath and it got the gears in my head turning. For good or ill, this could very well be a sneak peek at the future of Greyhawk (and the past in a twisted way). "Muster armies of footsoldiers, siege engines, monsters, and dragons to attack your enemies. Fight across the waves with fleets of warships and raging elementals. Plunder ancient dungeons with bands of mighty heroes, searching for magical artifacts and awesome treasures that might tip the scales of battle in your favor. The fate of empires is in your hands!" "In addition to the traditional trappings of a strategic war game, Conquest of Nerath includes a new element that makes it a uniquely D&D experience. As you can see from the above illustration, the board contains dungeon spaces scattered across the world. These add an exciting option that changes every time you play. As you build armies and send them out to crush your opponents, the dungeons make possible another kind of strategy. You can recruit heroes and send them into the dungeons to find treasure and magic items to help you win the game—provided you can defeat the monsters waiting there." "...in addition to our ongoing efforts to provide the best RPG products we can, D&D R&D is hard at work looking for new, fun experiences to engage fans everywhere. 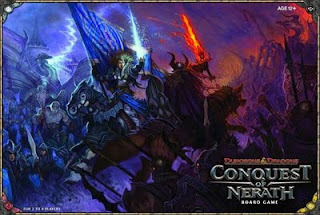 Conquest of Nerath and the Adventure System games are just the beginning. We’re experimenting with games for younger fans, Euro-style board games, and other fun ideas that take the D&D brand to places it’s never been before." FYI, Euro-style boardgames (or Eurogames) such as The Settlers of Catan are very popular and Wizards apparently wants to emulate that. For example at Gencon 2010, Catan had booth space in the exhibition hall that rivalled or probably exceeded that of Wizards. This my friends, may be Greyhawk's direction in the coming years. Since 4th edition's launch, fans have speculated endlessly on when Greyhawk might get its turn at a new setting update and how it might be undertaken (such as Forgotten Realm's world-shattering changes). All the while, Wizards has slowly been ramping up its collectable card game and boardgame lines, which puts the brand more in line with what parent company, Hasbro is familiar with. Ravenloft has already been passed over for an RPG setting book in favor of the boardgame treatment, and now R.A. Salvatore's Drizzt is going to give the Realms a big boardgame presence in October. In my opinion, a rich setting such as Greyhawk can easily derive enough content to spawn a complex boardgame akin to Settlers of Catan (plus expansions) and Wizards R&D knows it. The added benefit for Wizards going this route is people don't grumble about boardgames like they do RPG settings (unless those boardgames affect the RPG like Greyhawk Wars did). So by turning Greyhawk into a self-contained complex boardgame like Castle Ravenloft, you draw in board game enthusiasts (many of which may know little GH at all), and you'll snare the long time Greyhawk community from all the varied edition crowds, because to put it bluntly, we are suckers for new Greyhawk stuff. 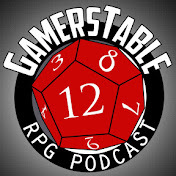 Does this mean the Greyhawk setting may never see any RPG update if it goes the boardgame route? Not necessarily. The core world of D&D seen in Conquest of Nerath is the same place they'll continue to use for 4th edition splat books, articles and future D&D Encounters events. A self-contained Greyhawk boardgame could very well run along with an RPG treatment the same way Greyhawk Wars was meant to complement From the Ashes back in 2nd edition. Anything could happen at that point. Mind you, this isn't how I hope things turn out, it's just my newest prediction before Wizards announces their 2012 products in August. I'm sure I don't need to tell any one this news, and by now it may be too late, but there are some who predict that today will usher in the end of the world....of Greyhawk! Yes, there is no better time than now, to "enrapture" you by looking back on one of the worst executed ideas in the history of Greyhawk canon. The Doomgrinder by Steve Miller, is part three of the Lost Tombs series. Published in 1998, this module followed up on hooks originated in From the Ashes, about an apocalyptic stone windmill near Greyhawk City. What was once a quirky, mysterious place with potential, became a ridiculous campaign-altering blemish on the setting. Those who have read or played the Doomgrinder, you have my sympathies, for those who know little about it, I won't spoil it in case you want to wreck your Greyhawk campaign yourself someday. Until then I'm willing to share some common knowledge and rumors about the Doomgrinder with you. Enjoy! "What Everyone Knows About the Doomgrinder"
Doomgrinder stands in an exceptionally fertile valley east of the Cairn Hills. The structure looks like a windmill made entirely of black stone. Even its sails are stone. No one knows who built the structure or why. On an irregular basis- every few years or so- the stone sails move. When they do, there's always a massive lightning storm. sometimes the ground moves. Lots of people think that Doomgrinder indicates the approach of the world's end. When one of the sails reaches its zenith, the world will end. Doomgrinder's sails only have to move one more time before one reaches the zenith. Doomgrinder is home to fairy folk, who steal children and teach them foul magic. The Circle of Eight knows how to stop the Doomgrinder, but they are going to let Oerth be destroyed so they can gain more power! When Doomgrinder reaches its zenith, Vecna will rise again and take dominion over Oerth! Doomgrinder was built by Zagig the Mad Archmage...when it's done, the entire world will be shifted into his dimension of madness. Iggwilv has returned to Oerth, and reclaimed her old seat of power - Doomgrinder! Doomgrinder was built by invaders from another world. Rary knows the truth about doomgrinder. That's why he turned against the Circle of Eight years ago. Those all sound pretty cool, yeah? Well my adviceto DMs then is to take this information from the module above and make it your own. As Greyhawk publications go, the Doomgrinder is best "left behind." 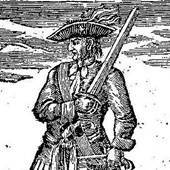 After dining with the Governor of Sybar, and some fooling around with the help, the PCs learned more clues about their leader, "the Blackguard" Captain Rennaud. It seems the good captain is not liked among half the populace of the Hold due to his untold origins in the Kingdom of Keoland, the Sea Prince's primary rival. Captain Rennaud once served on Prince Jeon II's ship as well, before gaining his own commission. Related to their captain's secret background, there is also politics coming to light between those loyal to the Prince and those loyal to the House Toli. Luckily(or unforunately) for the PCs and the rest of the crew, Hold politics is the least of the Bird of Prey's worries. Fully restocked, the ship set sail again, bound for "the Hook" of the Amedio Jungle and the Olman Islands to the south. Procan and the wind gods favored them that week with strong winds, but extremely hot temperatures. Araxo's high-class hide blistered in the sun while he barked out orders to his more tanned compatriots. After they had rounded the cape of the Amedio to their starboard (bypassing Fort Blackwell) the lookouts sighted a monstrous lizard coming out of a lagoon on the far shore. This excitement was met with much speculation about what it was exactly, but it was the jungle-born Cuahto that knew for sure it was a giant crocodile. Upon hearing this Victor began to lust for a crocdile hide coat. "Left-tenant" Tydan went to the captain and convinced him to give the men some sport and hunt the great beast for its valuable body parts. Five volunteers were called on to take to shore and slay the creature. Araxo exempted himself on this death-defying mission despite the protests of Cuahto for a leader on the away team. Captain Rennaud put "Mr. Hammond" in charge since he seemed so eager to skin the croc. Added to this team was the ranger skills of Cuahto and "Bullseye" Arborius who claimed he could put an arrow in the eye of the croc from 100 yards out. Brother Pickles the cook blithely joined the rowboat, bringing a chicken for bait and a crock pot of chili for the others. One last person was reluctantly added, Billy Palsy son ofnfellow crew member Old Bill Palsy. His hands shook not from fear of the croc but merely an inherited condition. Going ashore, the plan was to use a grapple and line, with a chicken attached to fish for the large croc and hopefully wind it up helplessly in the rope. The other end of the rope was tied to a tree, while the others waited nearby to react (Bullseye kept his short bow readied). The croc warily watched the approach of Cuahto but took the bait anyhow. Thus began a fierce struggle. Cuahto, Billy and Vic started a tug of war with the croc, while the lame-brained Pickles threw caution to the wind and ran knee deep into the water to whack it over the head with a ladle. Bullseye fired at it, but missed (his inaccuracy blamed on Pickles being in the way). Victor yelled threats and obscenities at the archer since he wanted no holes in the hide that would someday be his coat. Things got worse as the rope broke and it began to drag them in a tug of war toward the water. Losing their edge, Cuahto scrambled for a new rope to bind it with and Billy hung on for dear life. 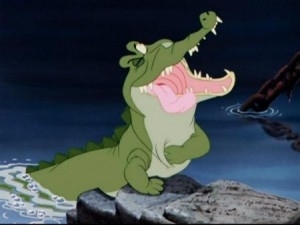 Victor on the other hand let go and leapt onto the back of the croc. Araxo, watching from the ship with the others could only wince as the croc rolled and thrashed about in the water's edge. A second arrow missed from Arborius (not going unnoticed by Vic), Pickles bent his ladle incessantly attacking, and soon Cuahto managed to lasso the snout of the angered croc. Just as the large beast was on the verge of throwing off all its bonds and attackers, Victor managed to deliver a killing cut to the throat of the croc thus ending a long and drawn out hunt. The crew celebrated while Bullseye was slapped around a bit. After the crocodile fishing expedition, the Bird of Prey continued on unabated for a week. The hot temperature persisted and their tail win died a bit. The island port of Narisban was reached at last and their ship put in and began moving cargo to trade for local goods of fruit, rare wood and rum. The PCs got their shore leave later that night and headed to the main rowdy bar in port, the "Last Respite." Here, Araxo Tydan chanced to meet and talk illicit business with Symeon Flinch, an officer on the Hideous, a part of the piratical "Crimson Fleet" and avowed enemies of the Blackguard. This did not bode well for the scheming first mate, but due to his wily personality, an agreement to meet for a transaction was made. Game note: I plan on the Crimson Fleet being an important faction in this campaign. They were originally seen in the Dungeon Magazine Adventure Path, Savage Tide. "Sometimes you choose a career. Sometimes the career chooses you." Another fine Greyhawk short story has been posted at Canonfire by first time contributor Ragr. His tale, The Knot is about an aspiring young blacksmith apprentice named Ryel, who finds trouble and the possibility of a new career path down the road. It's not a long read but very evocative in its setting and mood. Check it out! Two days out of Port Torvin across the Bay of Javan, the Bird of Prey hugged the coastline of Cape Rhon (also known as "the Sword") where lies the capital city and port of Monmurg. That night as Vic, Araxo, Cuahto, Big Tomas and Shrill Simon were on watch, the ship was unexpectedly paid a visit. An eerie greenish light approached them and to their stomach turning horror it illuminated a disgustingly ugly, dripping wet, sea hag who affectionately introduced herself as Granny Greengills. Victor and Tomas' legs began to buckle with weakness at the sight of her. With a wicked grin full of rotten teeth, Granny warned the onlookers to not call for help or else suffer her Evil Eye; a deadly glare that she soon demonstrated on a hysterical Shrill Simon, who fell to the ground dazed in a frozen, frightful stare. Granny Greengills gave the rest a bargain: Turn over to her the handsomest among the four remaining and she would give the rest of them information on a valuable shipwreck nearby. While Araxo did ponder the deal (and the others reasoned out who was handsomest), the prospect of selling out a fellow crewmate was too much for Vic so he attacked even though he was so feeble he could barely swing his sword. Cuahto and Araxo joined in while Big Tomas raised the alarm. Granny was not put out by the brash youngin's however and she managed to get the comely dark-haired Olman in her steely grip. As she began to drag him toward the rail the PCs began to stall, bluffing and fast talking to get her to give them the location of the shipwreck in exchange for the willing surrender of Cuahto (poor expendable savage). Hesitantly triumphant she revealed to them the site of a battle near Monmurg, the Battle of Jetsom Island where their country's namesake, the flagship Sea Prince was sunk by the Keoish Navy. Underwhelmed by the revelation of this well-known and hallowed sunken ship, they managed to throw a lasso around her neck and draw the gangly Granny Greengills off her feet. Their victory was almost cut short as she still had the ability to use her Evil Eye. Only the timely intervention of the Captain to cut her loose and dump her back into the sea prevented any further injury. Shrill Simon who nearly died of fright, was dazed for three days afterward. Araxo was nonplussed that he hadn't thought of faking a similar malady to get out of work, while Victor blamed this misfortune on the woman, no not Granny Greengills, fellow female crewmate Elaine "scar" Medorga. At any rate, the crew was commended and healed, then the ship continued onward for the next few days, eventually harboring at the small port of Sybar on the isle of Sybarate. Here they took on more supplies for the longer leg of the journey to Narisban, and while there Cpt. Rennaud invited the brave PCs (Pickles had to stay in the galley and cook for the crew) to go ashore with him and have dinner at the palace of the Governor of Sybar, Kel Imell. At the modest plantation estate, they met the governor, his daughter Juliana and Bishop Arun Del of Velnius (a wind god). The PCs noticed that while the governor was good friends with their captain, most of the servants and soldiers did not hold a favorable view of him. Intrigued by this the trio intended to look into this while at dinner but got distracted. Cuahto for his worth was at least allowed to eat at the governor's table instead of out back. Araxo hit on Juliana only to learn of her obsession with someone fancy lad from Fairwind Isle named Orlando, while Victor chased serving maids around the kitchen. Plenty of time for more answers and escapades next time! Game note: For this campaign I drew by hand a huge hex map of the Keoland-Hold of the Sea Princes-Amedio-Densac Gulf area on a piece of hexagon printed Gaming Paper. We first saw this stuff at Gencon 2010 where it won an Ennie award. It's essentially just wrapping paper with squares/hexes but the inexpensive, disposable nature of it makes drawing maps in advance more fun and it frees up our normal erasable battle mat if needed. I don't intend to pitch this South Seas map though, its a beaut even on wrapping paper! By now you've seen or heard about the new Marvel movie, Thor. Why am I bringing up a comic book character based on Norse mythology? If there is one thing I like more than the World of Greyhawk, it's got to be the Mighty Thor. To date I own over 400 issues of the comic which has been around in several volumes since 1962 (Journey Into Mystery #83). Yes, I am a Thor-junkie. Thor and the Norse pantheon have always been a good fit with D&D. The Norse pantheon appeared in the classic 1st edition Deities and Demigods. Their domains were also covered in an article by Roger E. Moore titled Plane Facts on Gladsheim in Dragon Magazine #90. In that same issue he wrote a module set in the dangerous mountains of Jotunheim called Aesirhamar. I highly reccomend this issue for anyone wanting to run a planar quest in this genre. The Mighty Thor comic is also a good resource for anyone wanting to run something in the plane of the Norse gods. Here is a couple great maps from the Thor Annual #10 of all the various worlds including Asgard, Jotunheim, Muspelheim and more found within the pages of Mighty Thor. Despite being set in modern times, Thor's fantastic background of monsters (Midgard Serpent, Frost Giants, Fenris Wolf, etc.) and magic (Norns, Loki, Enchantress, Lorlei, etc.) make any issue you pick up a possible inspiration for an adventure. Even if you don't read comics, or use Norse gods and vikings in your game, at least go see the movie. Not only is it is an action packed spectacle to see, but you may even find something that works for your game. Enjoy! "What will you do when the lights go out? You'll have to plumb the depths of the legendary Evard's darkness, defeat deadly enemies, and fight your way back toward the light if you want to survive." Wizards of the Coast is now advertising their next D&D Encounters storyline beginning on May 11th, aptly titled Dark Legacy of Evard. There is not much story info on it yet, but it does mark another Greyhawk affiliated element coopted for this popular group play event. Last time D&DE featured a tie-in to the Ghost Tower of Inverness. Is this a trend? We shall see. Just for fun, I'm predicting the next D&DE will use the Forgotten Temple of Tharizdun. 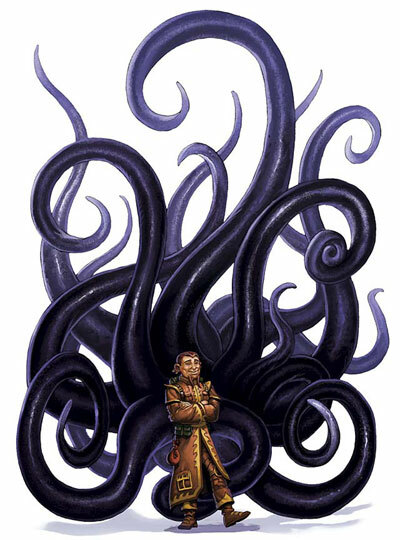 Evard of black tentacles fame was last seen in Dungeon Magazine #107. In that issue Evard is a 16th level wizard (conjurer) from Bissel, known for being an information broker and a former friend of Mordenkainen. Given the flavor text for Dark Legacy of Evard, I have a feeling this event ties into Wizard's recent Shadow-themed books like Heroes of Shadow more so than any prior Dungeon Magazine (Paizo) lore written about Evard. But at least this time they've picked an obscure NPC to develop (even by Greyhawk standards), so I won't begrudge the writers for whatever new material they come up with this time around. Mage Hand is a handy spell after all! I've said this before, the 1st edition Dungeon Master's Guide is my favorite D&D book of all time. I know I'm not alone in this sentiment. There's not a dull day that goes by that I can't pick up this book, flip to a random page and find something in it that I don't ever remember reading. The DMG is mostly packed with information useful to gaming yet often there are entries that are so esoterical that they border on useless. But that's the beauty of the DMG, because once in a blue moon a situation might arise in a DM's game and lo and behold Gygax has it covered. One of these oddly improbable situations is the Potion Miscibility Table (Pg 119). 2) a potion is consumed by a creature while another such liquid already consumed is still in effect. ...it is suggested that the following table be used - with, perhaps, the decision that a 'delusion' potion will mix with anything, that 'oil of slipperiness' taken with 'oil of etherealness' will always increase the chance for the imbiber to be lost in the Ethereal Plane for 5-30 days to 50%, and 'treasure finding' mixed mixed with any other type of potion will always yield a lethal poison. Whatever certain results you settle upon for your campaign, the random results from the table apply to all other cases." (01) EXPLOSION! Internal damage is 6-60 h.p., those within a 5" radius take 1-10 h.p. If mixed extenally, all in a 10' radius take 4-24 hit points, no save. (02-03) Lethal poison results, and imbiber is dead; if externally mixed, a poison gas cloud of 10' diameter results, and all within it must save versus poison or die. (04-08) Mild poison which causes nausea and loss of 1 point each of strength and dexterity for 5-20 rounds, no saving throw possible. ; one potion is cancelled, the other is at half-strength and duration. (09-15) Immiscible. Both potions totally destroyed, as one cancelled the other. (16-25) Immiscible. One potion cancelled, but the other remains normal (random selection). (26-35) Immiscible result which causes both potions to be at half normal efficacy when consumed. (36-90) Miscible. Potions work normally unless their effects are contradictory, e.g. diminution and growth, which will simply cancel each other. There you have it. The drawbacks seem to outweigh the advantages, but if you think about that one in a hundred chance of a permanent effect from mixing two potions, it goes a long way to explaining things in canon like the extraordinary abilities and lifespans of quasi-deities like Heward, Murlynd and Keoghtom, or the abundance of transformed monstrosities like liches, animus, mongel-men and some yuan-ti. The Potion Miscibility Table is not hard to implement in any edition and I guarantee it'll add an air of suspense to these items that players take for granted.